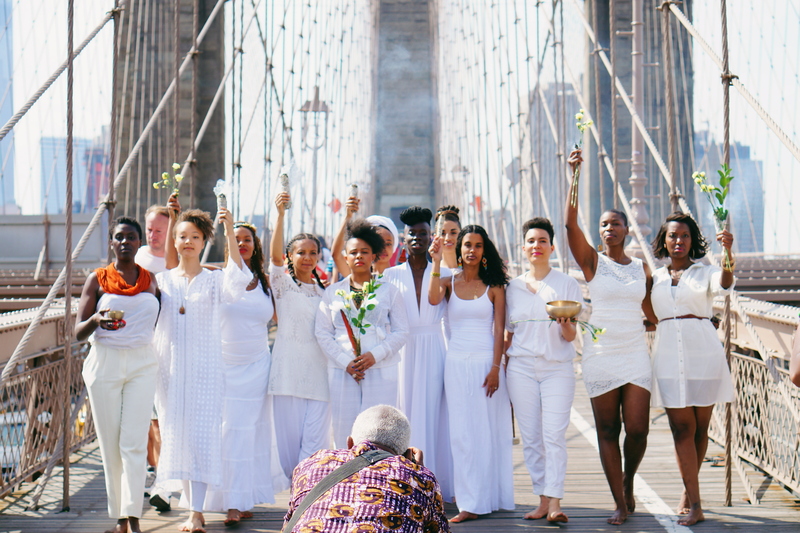 In conjunction with the exhibition Alchemy, Harriet’s Apothecary—an intergenerational, healing collective led by the brilliance and wisdom of Black cis women, queer and trans healers, artists, magicians, activists and ancestors—will facilitate six, one-hour healing sessions including meditation and restorative yoga. Capacity is limited; please RSVP. Offering: Our bodies are powerful vessels of self-discovery, healing and transformation. Together we will co-create compassionate embodied practices and breath work to lean into our body’s intuitive resilience and joy. Offering: Eva will be offering a yoga and meditation session centering release and softness. Offering: Olaronke offers 60 minutes of open level yoga bliss ; which includes deep breathing, guided meditation, and body loving asana. In this session we will stretch and tone the body, and open up the mind and spirit to the pleasure, joy and liberation of the present moment. * Folks are encouraged to bring their own yoga mats for this session. Offering: Through sound, breath, and guided meditation practice Beatrice will offer an opportunity to pause, listen in and to make space for ourselves admits the backdrop of our vibrant beloved Brooklyn. Each session will focus on a different theme ranging from working with compassion, sitting with the support of our ancestors and finding courage to feel through difficult emotions. - Bringing your own mat for yoga activities is optional (you don't necessarily need one, but may bring one). - Space in the gallery (where these sessions take place) is limited to 50 people. After that, participants are welcome to sit on the Stoop and join in as they are able. Harriet’s Apothecary is an intergenerational, healing village led by the brilliance and wisdom of Black cis women, queer and trans healers, artists, magicians, activists and ancestors. Our village is committed to co-creating accessible, affordable, liberatory, all-body loving, all-gender honoring, community healing spaces that recognize, inspire, and deepen the healing genius of our vessels. The intention of Harriet’s Apothecary is to continue the rich healing legacy of abolitionist and community nurse and herbalist Harriet Tubman. Like our courageous ancestor, we intend to expand access to health and healing resources that support our people in their healing journeys toward freedom. We also hope to connect individuals and communities to accessible self and community based resources that are rooted in the wisdom of our bodies, our ancestors and our plant families. Naimah Johnson is a politicized therapist, yoga instructor, doula, healing-justice practitioner, liberation-based educator and community activist. Within her work she applies a radically integrated approach, informed by activism, esotericism, liberation psychology, and diasporic traditions. She provides trauma-focused counseling through her private practice and in community-based settings, with a dedicated focus on the trauma of oppression. Naimah is a member of the transformative healing justice collective, Harriet's Apothecary; and also works collaboratively with organizations, institutions and groups providing liberation-based training, somatic practices and facilitating community healing spaces. Naimah believes in healing as a revolutionary act of resistance that is essential to our liberation. Adaku Utah was raised in Nigeria armed with the legacy of a long line of freedom fighters, farmers, and healers. Adaku harnesses her seasoned powers as a liberation educator,healer, and performance ritual artist as an act of love to her community. Alongside Harriet Tumban, she is the co-founder and co-director of Harriet's Apothecary, an intergenerational healing collective led by Black Cis Women, Queer and Trans healers, artists, health professionals, activists and ancestors. For over 12 years, her work has centered in movements for radical social change, with a focus on gender, reproductive, race, and healing justice. Currently she is the Movement Building Leadership Manager with the National Network for Abortion Funds. She is also a teaching fellow with BOLD (Black Organizing for Leadership and Dignity) and Generative Somatics. B. Anderson, healer, community organizer, birth worker, and ritual leader centers their work in restorative, healing justice and liberatory practice. B. teaches mediation and mindfulness classes across the city and is the co-founder of Love Circle Sangha, a BIPOC (Black, Indigenous and People of Color) + white comrade meditation community rooted in the Zen Vietnamese, Tiep Hein tradition and anti-opression frameworks. She is a core collective member of Harriets Apothecary, a healing collective led by Black Cis Women, Queer and Trans healers, artists, health professionals, activists and ancestors. B. organizes as the founder and co-conspiriator of intergenerational skill share incubator and resource hub, the Flatbush Community Freedom School at the Linden Library. Currently they work as a birth worker/doula for Welcome Home- Birth & Family Care, offering pre, birth and post delivery services in addition to family counseling for mid to low income, teen, queer, trans and immigrant families. B. offers as their commitment to healing generational trauma in mediator and relationship consultant with NYAH, a service agency nurturing a mindful approach to engaging love, family and our communities. all relationships.